My family is so excited to be reviewing the Yearly Membership from SchoolhouseTeachers.com. What is SchoolhouseTeachers.com? It is your go-to site for elementary, middle, and high school courses, videos, record keeper, and homeschool help. There are a variety of courses for all grade levels that at first I was overwhelmed. Instead of choosing something random for my kids, I let them each choose one subject and we did one project from each subject together. Luckily, as I was exploring the site, I saw that there are many things I could do with a kindergarten and third grade student together in their elementary homeschool courses! Kaelyn's choice was to do art. (No surprise there!) I came across Elementary Art with Jennifer Hawkins. I tend to neglect art in our homeschool because of time constraints so I thought this would be a great way to fill a need in our school. The course is laid out into units. The first unit focuses on a famous artist each week. We worked on the first week, Michelangelo! In the lesson plan Jennifer gives some background information, a list of books to read, and a fun craft to do. 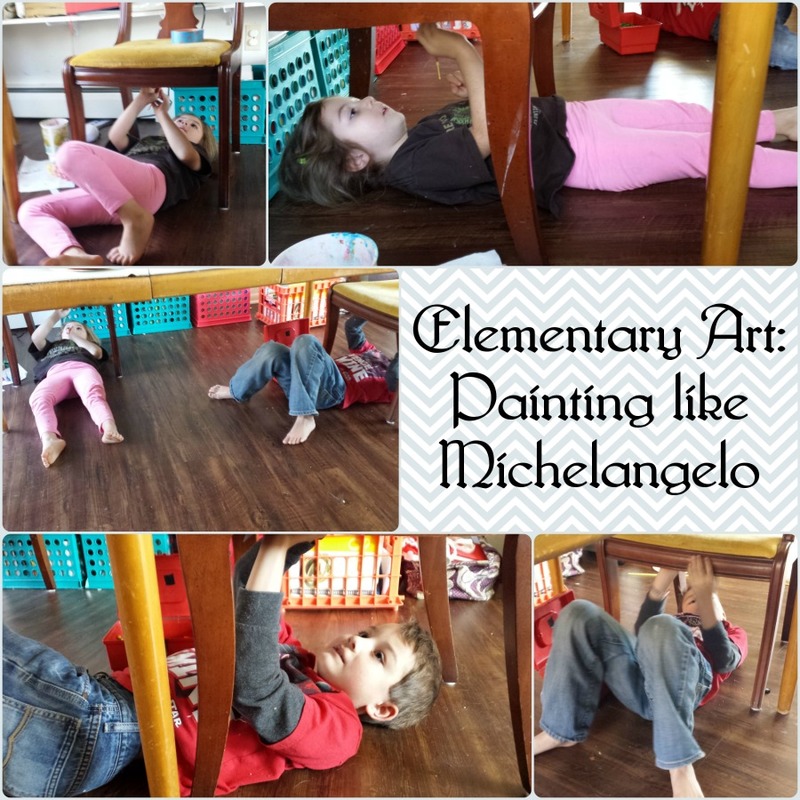 We were able to find one of the books at our library, so after reading about Michelangelo and looking at some of the art he made, we did the craft she outlined in her plans. Pretending to paint the Sistine Chapel was exciting for the kids. Although they complained about being cramped, they got a unique understanding of what it was like to paint on their backs and work like Michelangelo. The kids want to continue with this course and work on the other great artists throughout the second half of this year. I will oblige them because it isn't a difficult course to use and they are having fun. Sebastian wanted to do something space related so I looked at the science courses and found Everyday Astronomy. There are many lessons in this course, starting with the sun and going through the planets and constellations.. This course could easily fill your science lessons for an entire year! I started at the beginning with the sun. There are daily assignments, worksheets, and projects to do but it isn't overwhelming each day! We decided to read the story of creation, focusing on God's design of the lights in the sky. 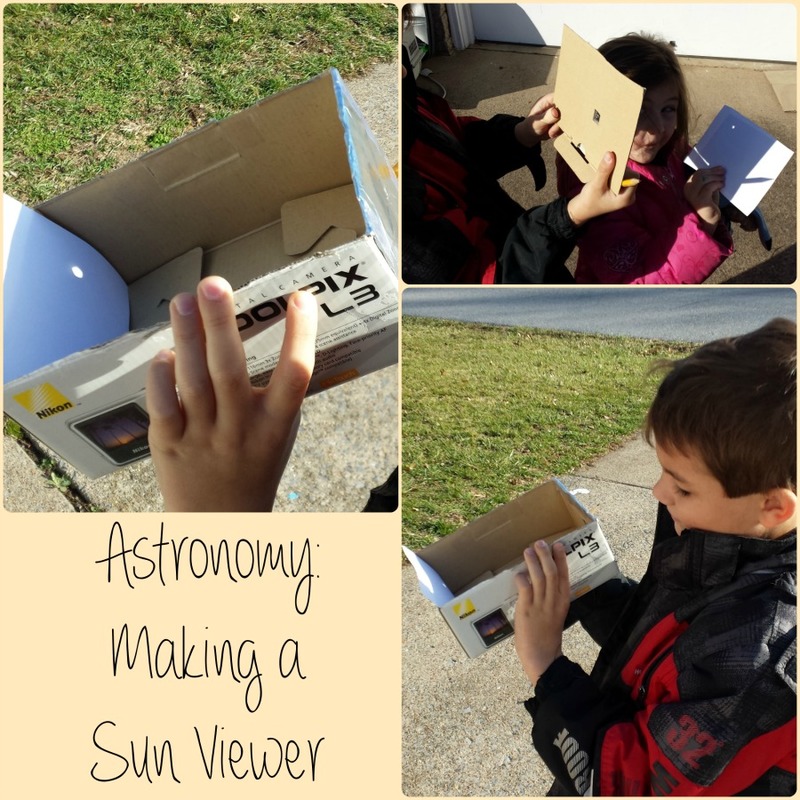 Using the lesson plans, we built two different sun viewers and took them outside on a sunny day to view the sun in a safe and fun manner. The kids loved the experiment! We will continue this course as well, although I don't think we will do every day's work. My kids aren't fans of copywork, but we will read the suggested scripture and do the experiments as we get to them. As I poked around on the site, I came across a few items I found to be interesting. With the yearly subscription, they offer many different Member Resources. They offer homeschool parent support as well as planners. Some of the pages of the planners I printed out to use incuded a field trip wish list form, a report card, a field trip report form the children fill out, a family chore chart, and an attendance chart that is just a simple box check each day. In addition to the planners, SchoolhouseTeachers can offer discounts to HSLDA and other associations. The membership is for your entire family and you can use the site 24/7. One of my favorite aspects of homeschooling is how we adapt work and school to fit our family's dynamics. SchoolhouseTeachers allows us that flexibility without losing the importance of learning. The yearly membership normally costs $139, but use coupon code: CREWFOLLOWER to receive a 50% discount!